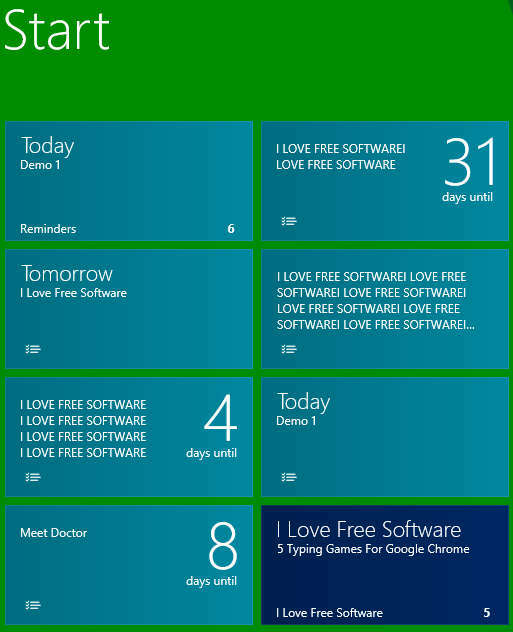 Reminders is a free Windows 8 Reminder app that lets you pin multiple notes as reminders on the Start screen of Windows 8. If you find it difficult to remember tasks until you note them down somewhere, you can use this handy app to make your work easier. 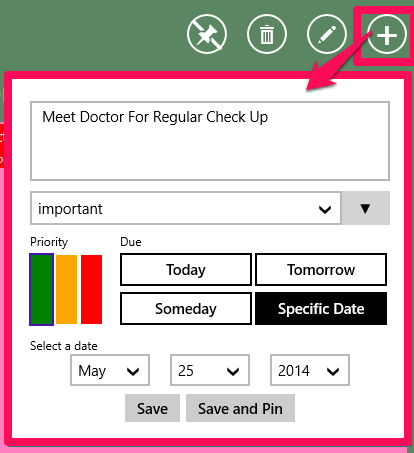 Within this Windows 8 reminder app, you can add your pending tasks with execution dates, and then pin them on the Start screen.This will let you have a quick look at your pending tasks every time you switch to your Start screen. To add a task’s due date you can choose from four different options: Today, Tomorrow, Someday, and even you can add any Specific date. You can also set priorities of your tasks (like important, very important, etc.) and then sort them as per the priorities. You can get free Reminders app from Windows store using the link given at the end of this review. After launching the app, you will find many different sheets on the home screen of the app with following categories: due today, due tomorrow, and due someday. The very first thing that you should do in this app is create categories for your task. It will help you to organize your tasks. To create one, right click on the screen, and then tap on add category. Enter the name of the category as per your preference. You can create as many categories as you want. Now as you have created the category, add tasks relevant to your category. To add task, click on plus icon at the top right corner of the screen. Choose category for the task from categories that you have added manually. Set priority of the task. Set due date of the task. If you want you can save and pin the task directly from here or save it to pin later. Saved tasks will appear on the note sheet available at the home screen. To pin any task from saved ones, click on the task and then click on pin option that appears on the top of the screen. Similarly pin as many tasks as you want on the Start screen. 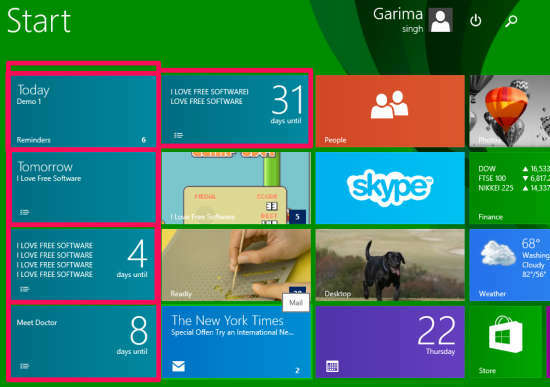 Your pinned tasks will appear on the Start screen of Windows 8 with due dates. The app even lets you change the color of the notes from provided options. To change the color of the notes, click on Settings under the Windows 8 charms bar and then tap on options. There you will find different colors to choose from. Choose any color as per your preference. 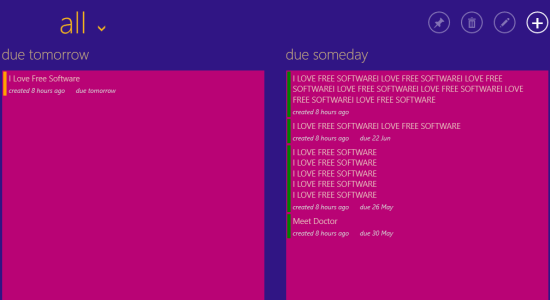 Reminders is a elegant reminder app to pin multiple notes containing tasks on the Start screen of Windows 8. 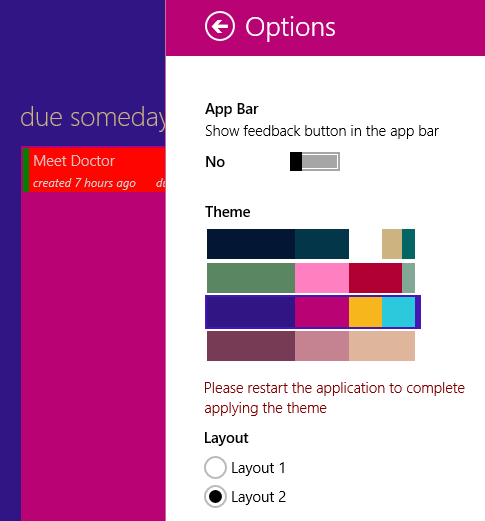 It lets you pin unlimited notes on Start screen and shows due date on live tile of relevant tasks as well. If you are looking for such app, then you should definitely give it a try. Also check 3 free Windows 8 Task Manager apps.